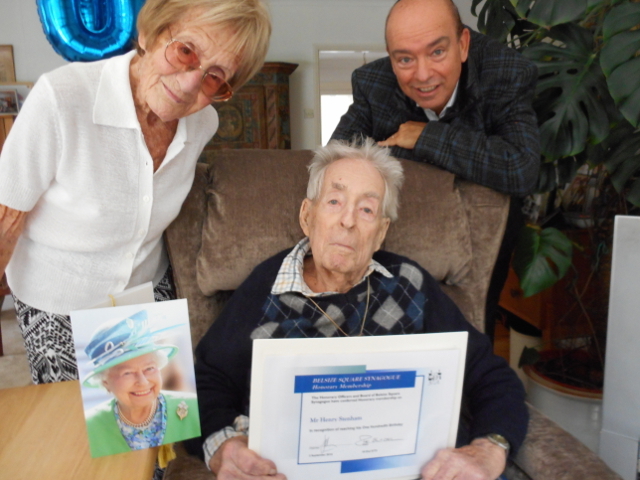 Condolences to the family of Henry Stenham, who died on 25 September, having celebrated his 100th birthday three weeks earlier, on September 3. The son of a Hamburg importer and exporter, Henry was sent to England in 1936 to continue his business training in an export company in a safe environment. On his visits home he managed to persuade his parents and younger sister to follow two years later. The family rented various rooms in Aberdare Gardens – if the name sounds vaguely familiar, think of the Abernein Mansions address of our columnist, Mr Klopstick. By good fortune, one of their neighbours worked as a secretary in the office of the Minister of Labour, Ernest Bevin. She obtained visas for them as friendly aliens, so Henry and his father, Arthur Sternheim, were never interned. While Mr Sternheim senior worked in the fruit trade, Henry joined the Pioneer Corps in 1940, changing his surname to Stenham. In August he married Marion Gestler, whom he met through mutual friends, and took two days honeymoon in Minehead in Somerset before returning to camp in Scotland. She had left Dresden in 1937. Henry was posted to Normandy after the D-Day landings of June 1944, moved with the fighting to Germany and stayed on after the war to report on the situation in such details as the number of cart horses in use and the opinions expressed in church sermons. He was finally demobilised in 1948 and joined his father in business. He started importing Danish whisky to fill the gap left by wartime interruption to Scottish production but he moved to the Real Thing as soon as Scotch started up again. His agency handled 50 labels, which he was involved in marketing. He named two blends as Henry Vlll and Queen Mary, creating labels which those in the know understood as referring to himself and his wife. This entry was posted in Our congregation on September 30, 2015 by Hilary Curtis. The Belsize Square Synagogue is a charity registered in England and Wales as a company limited by guarantee. Charity No: 1144866 - Company No: 7831243. © 2015 Belsize Square Synagogue. All rights reserved.